CCF awards grants to young investigators at leading local institutions for early phases of pediatric oncology research with the hope of speeding up the development of clinical trials. One such researcher CCF believed in is Dr. Jeffrey Toretsky of the Georgetown Lombardi Comprehensive Cancer Center. Dr. Toretsky received a grant of $4.3 million from NIH, based on the results he achieved with initial CCF funding. 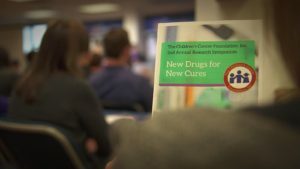 Since 2016, CCF has held an Annual CCF Research Symposium, where researchers that received the CCF research grants present the progress of their research and their findings. 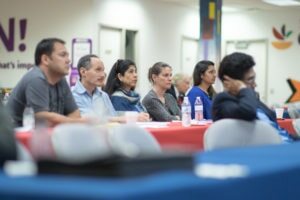 This opportunity to share data with other area pediatric oncologists is a unique opportunity to advance local cancer treatment for children. Learn more about CCF Research Symposia. The Children’s Cancer Foundation, Inc. (CCF) hosted its 3rd Annual Research Symposium on Wednesday, June 6th, 2017 at Giant Food Headquarters. NCI Pediatric Branch Chair Dr. Brigitte Widemann introduces Dr. Haneen Shalabi, also of NCI, and recipient of the 2017 CCF Giant Food Next Gen award. 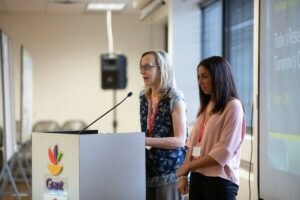 The Children’s Cancer Foundation, Inc. (CCF) hosted its 2nd Annual Research Symposium on Wednesday, June 7th, 2017 at Giant Food Headquarters. The Children’s Cancer Foundation, Inc. (CCF) hosted its first Research Symposium on Wednesday, June 1st, 2016 at Giant Food Headquarters. Visit page for video presentations and images.